Today I wanted to play with the new "Waterfront" set. I bought it because I thought it would be a great masculine set. I just can't seem to find enough masculine sets and when I see one I have to buy it! I found this card on Pinterest. You can see the original here. I did change it a little. Plus I used the "Guy Greetings" set and made this into a Father's Day card. I pretty much used the same colors as the original card. I thought I would copy a card first before I try one on my own. There's so many pieces to it and it was a great way to familiarize myself with them. So to make this card I used a folded half-sheet of Always Artichoke for the base of the card. On top of that is a 4" x 5-1/4" piece of Island Indigo. And the focal piece is Whisper White cut to 3-3/4" x 5". 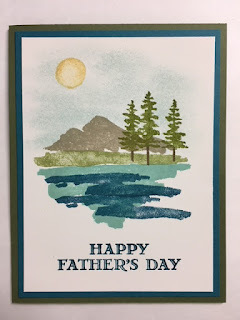 I stamped the mountain piece using Crumb Cake ink. Next I added the green strip under it by using Pear Pizzazz. Then I added the trees. I inked up the trees with Old Olive and used a Chocolate Chip marker to color in the trunks. Next I stamped Pool Party using the largest stamp in the set. I'm assuming this is a lake. And then Island Indigo was used to stamp the two darker marks. The sun was stamped using So Saffron. I punched out a 3/4" circle on the sticky part of a post it note and set it over the sun and sponged in the sky using Soft Sky ink. The original one was done using the Soft Sky alcohol marker. I tried that and it didn't look so nice going around the sun. SO this is my version of the card I saw. 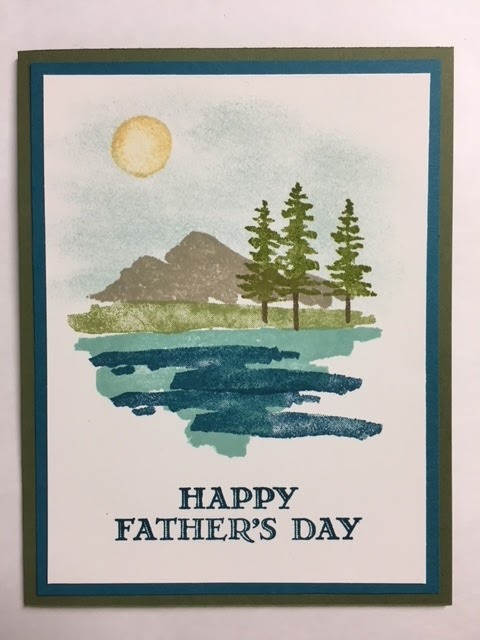 I like how it turned out and now I have a Father's Day card for my stash!! I love this stamp set and you did a beautiful job. Motivated to make one for my husband. Thank you! !